Search and social have long been touted as the dynamic duo in marketing, but data from Monetate’s Ecommerce Quarterly report shows email is the biggest driver of conversions in Q1 2013. In analyzing more than 500 million shopping experiences, Monetate found the conversion rate for email marketing was more than 3 percent, while search came in under 2 percent and social under 1 percent. But conversions weren’t the only area where email shined. Email rivaled search as a top referrer leading to the most page views on a site. Search remains a crucial driver of traffic for ecommerce, generating 31 percent of website traffic versus just 3 percent each from email and social media. “Search is always going to drive a high volume of traffic because it is driven by the user’s intent,” Lyon said. The study notes, however, that nearly half of the 500 million visits analyzed showed “no referrer” traffic, and that could be visits from native apps or traffic to HTTPS websites disguised as no referrer. With all that traffic, how do site owners capitalize on it? And speaking of conversions, can you guess which search referrer drove the most conversions? You may be surprised: it’s AOL search. Monetate didn’t have any specifics on why AOL was converting so well. Even though traffic data from the EQ1 2013 report seems promising, historical data from Monetate shows website traffic from search, social, and email are all down from the same time last year. When asked if brands need to rethink social advertising, Lyon says social commerce does have a way to go, and that brands should perhaps focus on “influence messaging” and sharing among friends versus direct calls to action. Of the .71 percent of social conversions, visual marketing platform Pinterest saw the highest spend. 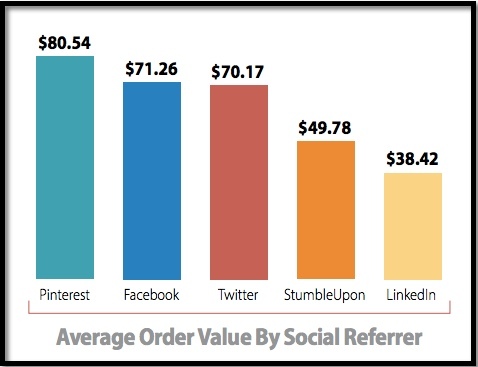 Average order value from the Pinterest referral was $80.54, with Facebook trailing behind at $71.26. Implement a social login on your site to keep customers on the website longer. Provide interesting content or insider deals and promotions for your social media fans. Give visitors even more reason to share, like offering customer reward points or dollars for on-site social behavior that drives sales. Don’t overlook simple, but proven tactics like badging your “most liked” products. Segment your social refers and consider giving special offers to the group that doesn’t have as high of a conversion rate as the others. Are you seeing the same lift in conversions from email marketing over other channels like search and social? Please share your experiences in the comments below.